project create something: Oh Joy! I’m taking an online class called “It’s Elemental” put on by Tiffany Tillman right now. It’s all about how to properly embellish (which is the part I’m most afraid of, particularly in my digital layouts!). I’m loving it so much – I’ve learned a TON in the first two weeks. Here’s my digital layout for our assignment for last week. 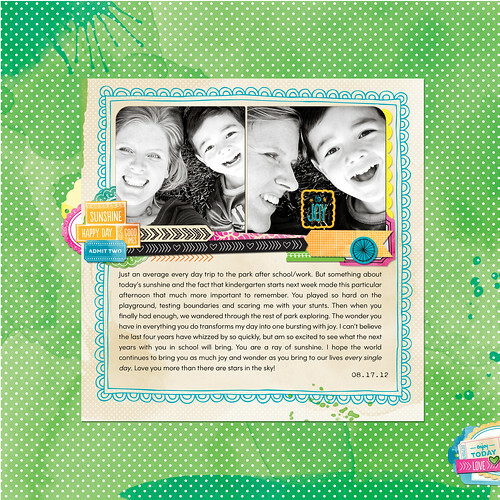 This line designed by Amy Tan is so fun and full of sunshine! As always with my digital layouts, feel free to click the image to go to the flickr image where you can see the journaling a bit better.